Carbide-tipped traction device for icy conditions! SITS come in various lengths that are inserted into the raised tread of a tire, leaving the head of the stud slightly protruding, thus providing traction with the driving surface. Install and remove easily with a drill or driver and a special attachment tool that is included with each box of studs. Designed to be installed and removed as conditions require. The studs can be reused year after year. The studs leaves a minimal mark in the rubber. All Screw In Tire Studs are sold in box quantities of 100 studs. 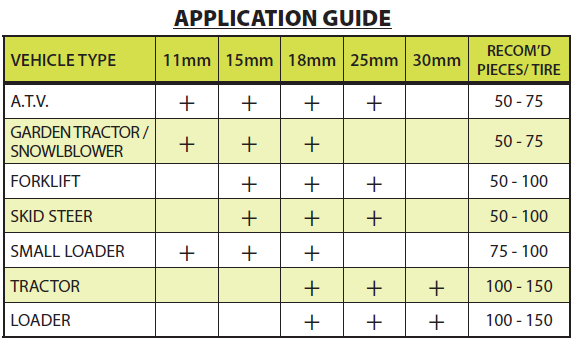 Each box also includes the appropriate installation tool for the stud size. Installation tools are also available for separate purchase. 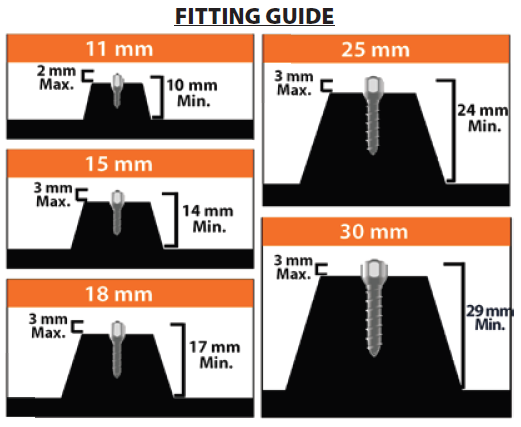 The Fitting Guide below shows how to determine which SITS size should be used (depending on the tire tread depth) as well as how much the SITS should be protruding. Before undergoing full installation, ALWAYS TEST FIT ONE STUD by completely driving it into the raised tire tread and then removing it. Next, spray stud hole with soapy water to check for air leak. If leaking, use a smaller stud. If many oversize studs are installed without following this procedure, it may damage the tire beyond repair.